Get Fruity!! Released on Vinyl, Tape, and Reissued on CD! Yello Fruiterinos! 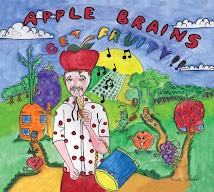 Apple Brains' debut Album "Get Fruity!!" got a proper release the other day and I'm super excited about it! Slovenly Recordings has produced a big apple green vinyl album that includes a coloring book inner sleeve AND decal sheet with full color stickers! It's quite a package to behold. They also released the CD, decal sheet included! This means you should be able to find it at an independent minded record store near you. If you don't see it, request it! Check it out! Our pals over at Burger Records also sweetened the musical format diversity deal with a limited addition tape release! If you have any way to listen to music besides an 8-track or mini-disc, Apple Brains is ready for ya! Expect show dates and a whole new splash of fruityness soon!